"Higher than today...but still some concerns. The problem today was a batch of high clouds on top of the lower stratus earlier today which likely limited the ability of the sun to dissipate the lower clouds somewhat. Also...the stratus was quite thick. We do expect clouds for tomorrow morning and we'll even have to watch out for dense fog in the morning. Don't expect full sun tomorrow...but it certainly looks like a partly cloudy scenario by the afternoon. Update: As of Saturday early afternoon, Twin Cities forecasters were using the B word to describe today's forecast. Kudos to @NovakWeather for being the first to tell us it would stay cloudy and cool. As of this Saturday morning, there was a huge disparity in forecasts for Saturday's high temperatures. Forecast highs ranged from the upper 50s to 74. Here was a sampling that we found. If you weren’t a television meteorologist, what do you think you’d be doing? At first I thought I might be a minister or an architect. The architect at the church we went to had a nice Volvo, while we had a Dodge Monte Carlo station wagon. But in 10th grade, I came to the conclusion that I wouldn’t be any good at designing houses or be able to drive up to church and give the sermon Sunday morning with my nice Volvo in the church parking lot. As I grew older, I realized I had somehow inherited the performance gene from my parents. My father was an artist by day and sang opera at night while my mom was a dancer in the chorus line. They met during an audition and the rest is history. I started doing television commercials in junior high and caught the TV bug. When it came to making a career choice, I never thought I could be an anchor. I was skinny and not the best looking guy – the original 90-pound weakling. I realized that weather was my best option if I was going to be in television. I was in an improv troupe in senior high school. We ended up getting a TV pilot on CBC in Canada in 1982. It was sort of like “Whose Line is It Anyway?” Back then, it was “Oh No, It’s Improv.” I still have reunions with that troupe and have been on stage with SCTV (Second City Television). I got to work with guys like Dave Thomas and Joe Flaherty, guys I grew up admiring and wanting to emulate. When I go back to Edmonton – if I go back at the right time of year – I get to go on an improv show called Oh Susanna! I’m still in touch with a lot of those people … it’s something about your roots. It helps keep you grounded when they call you a “sellout.” Some of them are still living five guys to a house trying to be that performer. I moved on from that a long time ago. What was it like to begin your career in the place (Edmonton, Canada) where you grew up? You talk about “local boy makes good” ... I went from part-time freelance weekend weather all the way up to chief meteorologist. I remember going on a conference call with the station VP to tell them I was leaving. They said, “Where are you going?” I said, “I’m going to Iowa.” Then all you heard were crickets … for like 30 seconds. People wondered how I could possibly leave the cushy gig at the number one station in the city where I grew up to go to Iowa! I knew I ultimately wanted to be in a bigger market and just wanted to try something new. I don’t think I would have been a good guy in the 50s when you got the job and you worked there for 30 years and got the gold watch. Life is just this grand adventure – like when my wife and I went to Paris for our honeymoon we didn’t have hotel reservations. We just want to try new stuff. But I’m not a journeyman. I’ve only worked in three markets in 20+ years, and hopefully we don’t ever move from here. My wife’s family settled in Golden Valley in the 1800s so in a roundabout way I have brought her home. This is great. What were the forecasting challenges you had working in Edmonton? Edmonton is 53.5 degrees latitude north. It’s not quite the edge of the earth but you can almost see it from there. If you look at a map, you’ll think, “Wow, I had no idea how far north it was.” In the winter, the sun comes up at ten to 9 and goes down at ten to 3. But in summer, you go play softball at 7 at night and the sun’s going down at five to midnight. It had different forecasting challenges. We had a very short, but intense severe weather season with an average of 15-20 tornadoes a year. A lot of people don’t realize we have those that far north. They have a very long duration winter. Snow would generally stay before Halloween and wouldn’t be gone until well into May. I once did a cut-in there nationally when it was 54 below zero windchill, 42 below air temperature. People are like, “Oh my god, how can you live there?” I just did. It’s like how do you live in Florida when it’s sunny and muggy? It seems like you’re part scientist, part performer and part graphic designer. Is that a fair assessment? I have no problem with that. As the chief, you have a large amount of input into how your graphics are going to look and how they are built into your show and all the other shows. There are some stations in some markets where if you’re watching the weekend weather it doesn’t look anything like the weekday weather. My buzzword is always seamless consistency. So if Keith Marler is working the morning show or Marina Jurica is working on the weekend, it’s the same graphics. To me, there’s a comfort level for the viewer in that. In today’s world, it seems like there is an almost limitless amount of scientific graphics you can create for the viewer. How do you decide what to present? The “whiz bang fly thru 300 MB (millibar jetstream) 15 days out shows the viewer something they don’t really understand just to make yourself look smart graphics” are a waste of time, and the research backs it up. My approach is to be genuine, conversational and back it up when you need to with solid graphics, excellent presentation and education. Science and graphics are not enough in this 150-channel universe. You must also engage the viewer. You’re part of a weather team. How much control do you have over what the next person on the team says after you leave the forecast behind? Do you think viewers follow a met or a station? That’s a hard one. I think they follow the team but always have a favorite team member. I’m the first to tell you that I’m not everyone’s cup of tea. And if you grow up in this business thinking that 10 people you run into in the street will think you’re the bee’s knees, you’re wrong, man. You hope that six think you’re kind of good. There’s a couple who could care less about you and then there’s a couple that might want to punch you square in the chops. Every job, no matter how glamorous it may seem to outsiders, has to have some challenges, some politics. How about yours? This is a real fickle business and you have to grow thick skin. It’s not too often when an accountant has to go through a review where they say, “You know what, your hair’s all wrong and you can’t wear that type of suit any more. Lose 20 pounds and, by the way, it wouldn’t hurt you to do a little workout, maybe build your upper body.” These are the things that people tell you and I don’t think there are many people who would take kindly to that. And just when you think you’ve got it, it all changes! And the new person comes in and says, “What do you mean they always told you to wear that? That’s terrible, and why’s your hair so short? I want you to grow it out.” And then you’ve got your agent who has ideas. I remember my agent called me once to give me “coaching” and he said, “You know, I’d cut your sideburns. I know the kids are wearing them like that, but you’re over 40.” That’s the hardest part of this business … everybody’s got an opinion. And it’s also the viewers that have an opinion. There’s a lady who sends me notes every time I wear an orange tie. She hates them. And … it’s just a tie. What do you do, right? You mention the Special Olympics often during your forecasts, particularly your polar plunges. Some viewers are bothered by what they see as an interruption in your forecast. What would you say to that? I’ve been involved with the Special Olympics since the 90s and have been doing the polar plunges for a long time. The Special Olympics here is a small organization with less than 10 employees. It’s not fancy. They hit $430,000 the first year, then $660,000. This year they hope to make $2.4 million from nine weeks of polar plunges. It’s created a movement. There are a lot of places that would not let their chief meteorologist talk about something like that every single night on the air but FOX 9 has been incredible in their support for me and Special Olympics. But if it’s not getting in the way of severe or life-threatening weather, why not? The money raised goes toward keeping people healthy, from ages 5 to 66. This is grassroots stuff, changing and saving some lives. I’ve always felt that wherever you work, try to leave it better. I don’t do this because I have to, I do this because I can. It’s not something I do just for the air; this is my life. Well, first and foremost, get the forecast right, and by doing that you can earn people’s trust… you literally audition for your audience every night and they vote with the remote. Secondly, it’s ratings. You gotta get the ratings to keep the job. I like to call it “infotainment.” I am a science geek who loves weather, but that is not enough to get you to watch. You have to be able to engage the viewers. I tell anyone new in this business, be yourself, be genuine and let the rest happen. And then from there it becomes a flow of everything that goes into getting the ratings. If you are correct with your forecast science and you are genuine then hopefully the ratings will follow. What weathercasters do you admire? If you could have lunch with one, who would it be and why? There’d be two people. The first one would be with a guy from Edmonton who I grew up watching. His name was Bill Matheson. And I think for my entire career, he’ll be the yardstick I measure myself by. And he moved to the states and was a big star down here but eventually went back to Canada and was on air until he was about 75. He was unbelievably entertaining. Unbelievably scientific. He was engaging, a wonderful, wonderful man. And I think second to that would be – and I didn’t get a chance to watch him as long as I would have liked to – but second would be somebody like Paul Douglas. Because it’s not always been about success for either of them, but how they handled it. You know, Paul has had some unsuccessful events, including the stint in Chicago, but he continues to reinvent himself. Paul and I get lunch together every once in a while. I sometimes even let him pay… he is a great mentor and friend. Like reading about the local forecasters? 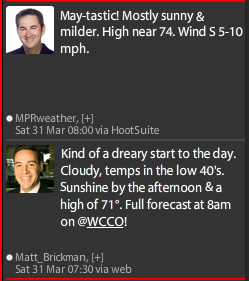 Here's one we did on KSTP's Patrick Hammer and another on WCCO's Matt Brickman. We also assisted with a similar profile on Keith Marler for Weatherist.com. Look for more to come. 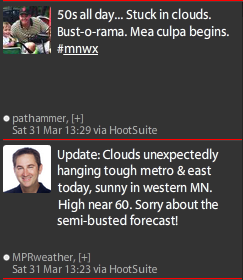 The Minnesota Forecaster provides analysis of both the weather and those who forecast the weather for the Twin Cities. For periodic updates, follow us on Twitter and Facebook. 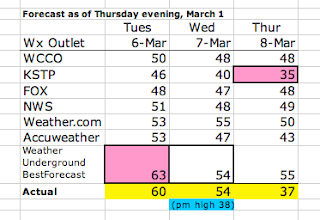 Here's the late Friday NWS forecast entering the last week of March. It's looking like the advanced spring is going to slow a bit. Lilacs at TMF headquarters have progressed quickly. 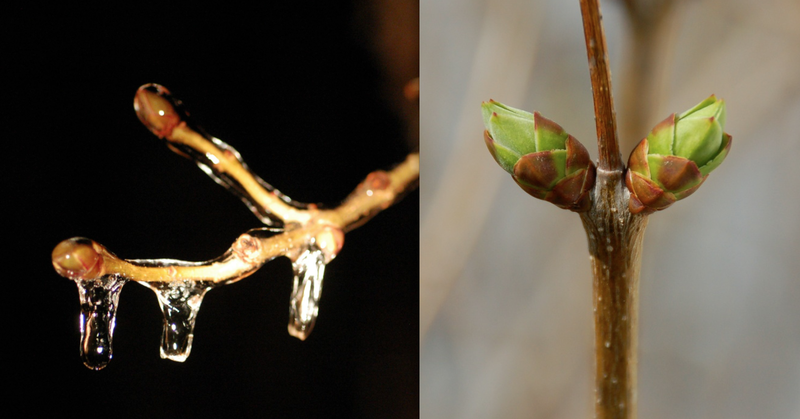 Pictures are from Feb. 28, March 16 and March 23. 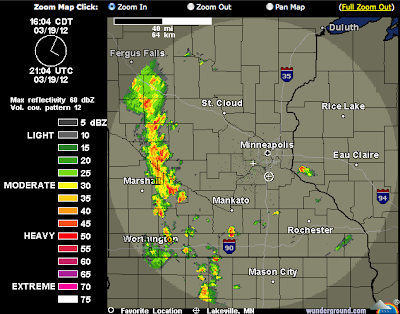 Last July, we wrote about "A Case of Nowcasting Gone Terribly Wrong," in which we wrote about Jonathan Yuhas's efforts to provide a nowcast, essentially a very short-term forecast, for how the weather might or might not affect a Twins game and a U2 concert. We wanted to believe his incorrect forecast was a one-time thing, a combination of bad luck and poor judgement. Now, however, we're not so sure. At the time, it struck us as odd that the tiny, isolated cell (in yellow, about a county to a county and a half just east of due south of Lakeville) could be expected to hold together and land on Lakeville by 5 p.m.
Jonathan did not respond to our inquiry. 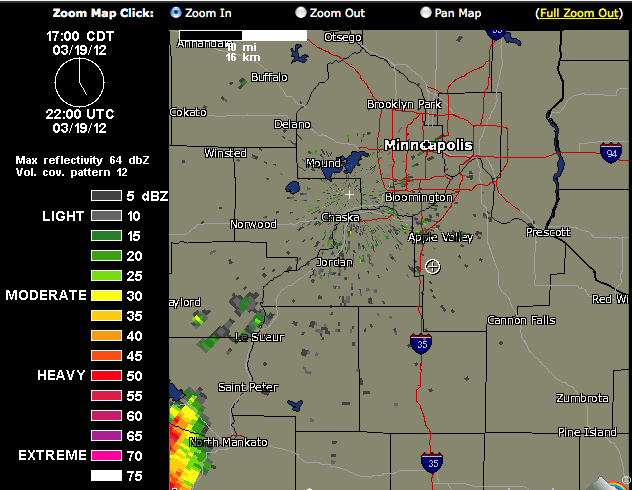 As the radar shows, there were no showers or thunderstorms anywhere remotely close to Lakeville. 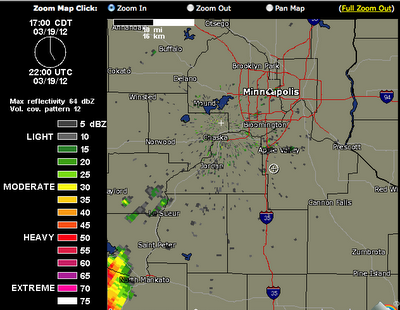 The t-storm near Owatonna, small as it was, had completely dissipated. We understand the value of short-term forecasting and warning people about precipitation, but it's our feeling that the science is not yet to the point where such precise forecasts can be made. We think weather consumers are better served by the more general precipitation "nowcast" tweets that many other local meteorologists were tweeting at about the same time. Being new to the Twin Cities and Minnesota since August, what are your first impressions? I absolutely love it here. The city is so nice. I’ve grown up around cities like Boston, New York and DC and they’re bigger and they’re not as clean. This is very manageable, and everyone is so helpful. I’ve learned from my “Best of Minnesota” segments that Minnesotans love to brag about their state and they should. I love it and I have no regrets. It sounds like your career path to becoming a meteorologist is a little different than others. Yes, that’s true. I went to school to study broadcast journalism, thinking I’d be doing news. I got a job as the overnight news producer while still in college and then became a reporter. The station where I worked (in Champaign, Illinois) was so small they filled people in from all over the place. After about a year, my news director pulled me into her office, and said, “Matt, what do you think about trying the weather?” And I figured, “Well, if I can do everything in this building, they can’t fire me!” So I gave it a shot and I really loved it… right away. I like working without a script and in a medium that kind of allows you to have a personality. It just excited me more and I enjoyed it more than anything else I’d done in the newsroom. While I subsequently went back to school to study broadcast meteorology, I still consider myself still a student and continue to further my weather education. One of the reasons I was so excited to work here was to work with guys that have been around a while and who really know their stuff. I still learn a lot from watching Mike Augustyniak put together a forecast. He has an incredible mind for science. I know that many meteorologists talk about the tornado they remember when they were small as stirring their interest in weather, but when I was 13, I wanted to be on Sports Center. Although I didn’t catch the weather bug until later, I always loved math and science. I just never thought about it as a career until I did it for the first time. I love it! In those days spent dreaming of becoming the next Stuart Scott rather than the next Jim Cantore, do you recall any meteorologists during your childhood? When I was a kid there was a guy by the name of Hilton Kaderli at channel 3 in Hartford. It’s not so much that I remember watching his weathercasts, but I remember the name “Hilton Kaderli.” A perfect TV name. Did you see yourself working in such a large market just a few years removed from college? No. I feel incredibly lucky to be in Minneapolis at 26. This was my dream market when I was in Champaign. I figured I’d go from Champaign to a slightly larger market and then eventually end up here well into my 30s. I feel really lucky to be here and especially at CCO, which is such a legacy station with so many talented people – including meteorologists like Chris Shaffer and Mike Augustyniak, and others on the news reporting side. When I get to go out and do stories, they just make me look good. What do you look for when you watch other forecasters? When I watch another met, I like to see their personality. I like to see how easy they are to watch. I think if you can watch somebody for two and a half minutes, and you get the information you need and you’ve got a smile at the end, I think that’s great. I like to see how different mets across the market show their personality. Keith Marler does a nice job of that with Fox. He’s very good. I like Patrick Hammer quite a bit as well. And of course I like Chris. He has as good a personality as anybody in the market. Except for the messy snow and ice storm at the end of February, precip in the Twin Cities has been way below normal since you arrived in August. Do you feel responsible? Good or bad I don’t take credit or blame for any of the weather. But it’s funny. We’ll get a caller or an emailer every now and again with someone saying, “Hey, thanks for the nice weather,” or “Could we get a little rain?” Course I explain I’m just telling them about it and that I can’t do anything about it. But to be honest, if I could control it, I would have loved some snow. I love snowstorms. I love forecasting them. I get to be really nerdy and dive into BUFKIT (to determine possible snow accumulations). Love that. It’s a Saturday morning and weather models have changed since the chief meteorologist’s show on Friday night. How much can you change the forecast? We have the ability to forecast as we see fit. I know that at some stations there’s a chief meteorologist forecast and everyone else is expected to follow it. That’s not the case here at all. Everyone does their own forecast. Now when we have bigger storms we’ll come together and talk about it when we’re all here, but when you’re the one here, you’re in charge. Do you have a preferred weather model? Certainly not this year as most haven’t performed particularly well! I think I probably like the NAM (North American Mesoscale model) more than anything else. I might lean a little heavier on that than I do the GFS (Global Forecast System) or the RPM (Rapid Precision Mesoscale model). When we get a storm coming, I rely heavily on BUFKIT. We don’t have a preferred model but we do use the RPM for our shows. It pumps out data every three hours so you get more up-to-date information. But it can be way off, too, so you have to be careful with it. How does the actual “weather show” in Minneapolis compare to the presentation you did in Champaign? Are there more/fancier graphic tools or weather models at your disposal at WCCO or is it essentially the same? The tools at hand are definitely more sophisticated. Getting updated RPM data every 3 hours is a huge advantage - the “future radar” I was using in Champaign was only getting updated every six or 12 hours. It’s also nice to be able to do the show in HD – I didn’t have that in Champaign. Essentially, I have more real estate to use on a map – which is great now that I’m forecasting for an entire state. What are some memorable storms that come to mind? In Connecticut, I just remember a lot of snowstorms. The most memorable individual storm I recall was when I was in Illinois. A tornado went through my inlaw’s town about a quarter mile from their house and there were train cars out in the railroad tracks that were thrown about 50 yards out into this field. What do you find most challenging about forecasting here? The tricky thing about this market is that you’re forecasting for the whole state. That is such a challenge. The weather in northern Minnesota, and particularly the north shore of Lake Superior, can be very different than in the cities. When I worked in Champaign, the focus was on a much smaller region from roughly Springfield across to about Terre Haute. The Chicago market covered all of northern Illinois, essentially leaving us a strip across central Illinois to forecast. Speaking of the Chicago market, what are your thoughts on Tom Skilling? Do you think his strong science approach would fly in other markets? Personally, I love it. For somebody like me who understands that stuff, it’s really neat to watch. I don’t think he’s too “sciency.” Yes, he does talk a lot in science terms, but I think he makes it understandable enough so that if you’re watching at home, you can get it. There’s just not enough time for me to get into that level of detail with our standard weathercast being two and a half minutes. If there’s any rain at all, there goes 30 seconds. 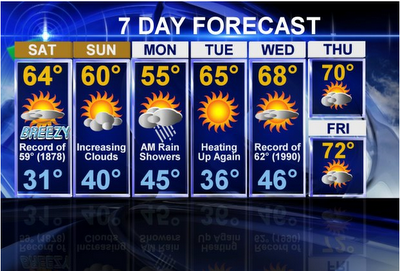 And the 7-day forecast at the end takes another 20 seconds. Skilling must get four or five minutes. I’d like to be able to do some of that stuff but most people just want to know lifestyle weather. However, when we get snowstorms, we do have the time to expand coverage and get more technical. How important is interaction with your viewers? I love when there’s interaction with viewers, whether it’s what they’re thinking on a forecast or giving us snow totals. I think that’s where all this is going. Everyone can have a hand in the pot and help us tell a story. There’s no way that we can be everywhere anyway, so to have these weather spotters across the state helps. We welcome the helping hand. 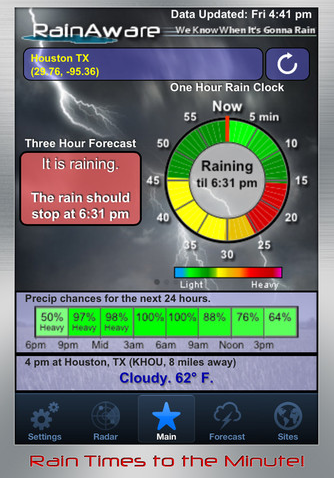 Do you have any favorite weather apps? I have eight weather apps on my phone right now - I'm a little obsessive about it actually. I’ve been scolded by my wife when we’re out to dinner or even on vacation and I’m tracking a storm on my phone. RadarScope is by far my favorite. It’s especially valuable in spring when we’re monitoring severe weather. Switching gears to a fun, non-weather question, if you set your phone to random, what three items are most likely to play? Well, I actually have a lot of podcasts, so something like NPR’s Fresh Air or CarTalk might come on. But musically, songs might pop up from the Black Keys, the Jackson Five or the Talking Heads. Given that you’re a big sports fan and March Madness is beginning ... if you were to play bracketologist rather than meteorologist, who would you take in the NCAA tourney? And without Illinois (or Minnesota), who grabs your rooting interest? UNC is my pick –so many talented players (Barnes, Henson and Zeller) that returned after an impressive year last year, they’ll be tough to beat. It’s usually a team with great guards that wins though, right? So, Mizzou would make sense, but I can’t pick them –blame it on an inferiority complex after going to the University of Illinois. My parents went to the University of Connecticut, and I grew up going to both men’s and women’s UConn basketball games. If I’m rooting for anyone, it’ll be the Huskies. Like reading about the local forecasters? 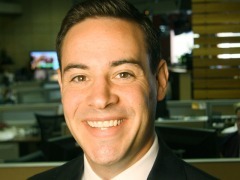 We've profiled KSTP's Patrick Hammer and another on Ian Leonard. We also assisted with a similar profile on Keith Marler for Weatherist.com. Look for more to come. Analysis: Here's the recap from the week's forecasts made as of Saturday, March 10 for the week ahead. The snapshot reveals that the National Weather Service was the most accurate weather outlet, with a 28-degree variance for the week (average of four degrees off for the week). WCCO was the best television weather outlet with a 32-degree variance. However, it should be noted that the Fox forecast was outdated at collection time and did not include the whole week's forecasts. And KARE11 does not forecast beyond five days. As often seems the case with a changeable, record-breaking week of temperatures, predictions often do not capture the significant day-to-day temperature changes, instead providing a more "flat" temperature forecast. (This portion written last Saturday.) 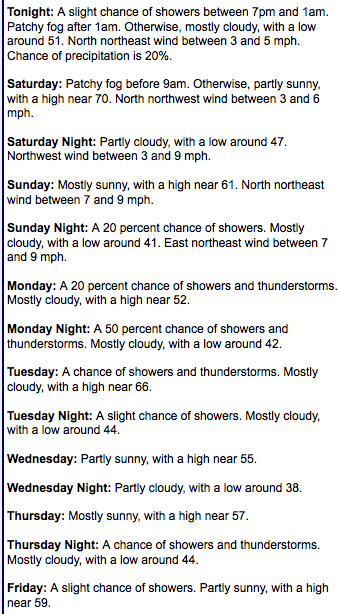 Most Twin Cities weather outlets were calling for a nearly unfathomable week of unseasonable warmth ahead, beginning with today. There was consensus that Saturday would be a record breaker and most forecasts suggested that records were in major jeopardy for Sunday (record of 61), Tuesday (record of 66) and Wednesday (record of 62). Records for Thursday and Friday appeared to be in some jeopardy as well, though forecaster consensus was not as unanimous. WCCO appears to be the most bullish on week-long record warmth. 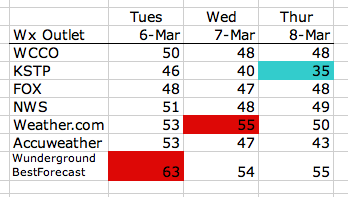 Last Thursday evening (March 1), we took a look at a few weather outlets’ extended forecasts for the current week of (very changeable) weather. 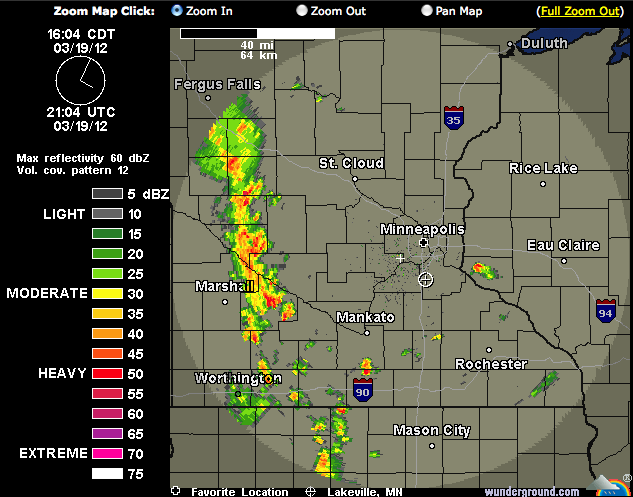 What struck us most were the forecasts of Weather Underground on Tuesday and KSTP on Thursday. Both forecasts stood out in marked contrast to all the others. Weather Underground’s (BestForecast) forecast high was 10 degrees higher than all others on Tuesday. Similarly, KSTP’s forecast high for Thursday was 8 degrees colder than Accuweather’s and 13 degrees colder than all others’. Odd, or so it seemed. But in the end, when Tuesday clocked in at mild 60 and Thursday registered a back-to-winter-like 37, the outlier forecasts were pretty much dead on. Here’s to the forecasters who aren’t afraid to stand alone and take risks. You keep life interesting, and sometimes, you’re the most accurate! Scanning the wire recently, we learned of a new weather app that seemed both unique and practical. The goal of RainAware, currently available as an iPhone app, is to “predict to within minutes when precipitation will reach a user’s exact location, up to three hours in advance.” Knowing that weather can be challenging to predict, we were curious to learn more about this app and how it works (and no, we’ve not yet tried it). 1) Pixel resolution of radar images and radar bin size. We go down to one kilometer resolution here when locking onto and moving areas of precipitation. 2) Radar data frequency. Typically 5 to 10 minutes, depending on what VCP (volume coverage pattern) the radar is in. The program looks for new information every minute and recalculates once new data is available, typically every five minutes. 3) The DBZ value used for precip. This can change depending on precipitation type, distance from the radar and vertical humidity profiles. These are really just estimates since the values vary. This could add a couple minutes of uncertainty. 4) Precipitation motion. This is a key element, and is difficult to attain accurately. We use several methods for extracting this information but our cornerstone is the “ensemble” method, which uses thousands of slightly different motion vectors and then uses probabilities to convert to most likely rain times. How confident are you that future radar can be predicted? We do not actually produce a “future” radar with our system, but we know there are some who try. This may be possible in some situations, but in other situations like summertime pulse storms it is impossible past a few minutes. What kind of testing have you done? Has accuracy been assessed? We have tested it thousands of times over the past two plus years, through all seasons and all areas of the country. With each case we observed, if it did not perform well, we investigated and re-wrote the code. In fact, this process will always be ongoing, in order to keep improving upon the system. It is very difficult to make a “one size fits all” scheme, so we offer user settings that can affect output. Namely, the precipitation threshold. If users, for whatever reason, seem to get too many false alarms, they can raise the criteria. The converse is true for lack of detection. Are there particular geographic locations where you’ve tested the app? We have tested it everywhere. There are gaps in radar coverage over the mountains of the western U.S., so it can’t work there. Also, it helps to have multiple radars covering the same area, which is true of the central and eastern U.S. That way if a radar is down you have a backup. There is logic build into the app that goes into choosing which radar is used. Then there are some areas that may have clutter more often than others. While we do employ clutter suppression, sometimes this comes through, especially near mountains. Lake effect snow is another area we will be improving upon by next winter. How much development has gone into the product? Over two years of testing and development and thousands of hours of coding. We are perfectionists, so this will be ongoing. Are users more apt to be over-warned or under-warned? We want to err slightly on the side of detection, but this is not a large bias. And again, users can adjust to one of three different sensitivity levels to suit their needs. If the app says it will rain in 13 minutes what are the odds that that will actually happen? At thirteen minutes out, it is highly likely it will rain but allow a few minutes (maybe three or so) buffer to account for the errors previously discussed. We use an ensemble of motions and the output is probability based so that “13 minutes” is based on a probabilistic threshold. If you look at the bar graph (third page of the app’s main screen), you will be able to see the probabilities (bar heights). The red horizontal line is the “best” threshold to use based on testing, and optimizing CSI [critical success index] scores for rain (CSI is a bit POD [probability of detection] biased). So while it might say, “It’s gonna rain in 13 minutes” on the main timer screen, a quick swipe will allow you to see how confident we are that it will occur. We feel the default threshold, out of the box, exhibits the best all around skill level. What about instances in which rain develops over top of a location, essentially without warning? You are correct. Summer pop up storms in weak flow environments are hard to lock onto and properly move. But the question is whether any human can do better staring at a radar full of pulse storms popping up. Our goal is to be as good or better than a human meteorologist. We do have methods we are working on to optimize this, so stay tuned. And yes, winter precipitation is more easily handled because of good flow aloft/steering currents. But light snow can also be hard to detect, especially if you are not close to the radar. It is difficult to determine whether you are simply seeing clouds and virga, or if there is light precipitation occurring. Do you have an idea of future upgrades and additional capabilities consumers can expect down the road? One of our first updates will include the ability to choose from a list of about 1,000 cities across the U.S. Currently, the program is limited to one’s GPS location and a short list of sites. Look for this in version 1.0.1, coming in the next few weeks. We understand the radar imagery in our app is basic, as it is meant to be more of a supplement rather than an all-out, full tilts program. We could spend time on improving the radar, such as adding pinch zoom. However, we are trying to focus on perfecting rain start and stop times currently. We are aware of its limitations. We expect the user interface may be redesigned at some point as well. Version 1.0.0 is only the beginning. We have a place on our website for users to enter feedback and comments that will help improve the system. Ultimately, RainAware has one main goal: to tell the user what time precipitation will begin and end. Our vision is to someday make this information as easy to get as the time of day. Imagine always having a rain time wherever you see a clock. That’s an awful lot of computing power, but possible. Have you tried RainAware? Feel free to leave your comments.